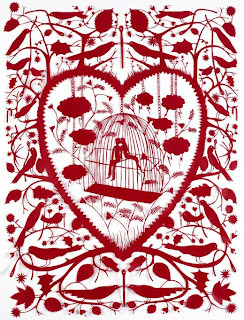 Rob Ryan is a British print maker and illustrator. He mainly works by creating paper cut outs and screen prints. He has collaborated with Vogue, Paul Smith, Liberties and many publishers. His first book of exclusively his own work was published in 2007 called 'This Is For You'. It is an adult fairy tale following themes of love and loneliness. For me Rob Ryan's work can be overly sentimental as he likes to write in quite a poetic style, almost always about people and lost love. He likes to feature people, birds, trees and clouds, all surrounded by lots of hearts. Its the tiny intricate shapes I like. The image is initially quite simple - all one colour and very flat in appearance. But once you appreciate how much care goes into each image, with every part painstakingly cut out, they seem even more special. In his book Rob Ryan told a story through a series of images, but I like the way often tells a story through a single image. In his Christmas window for Liberties he created a large scale paper cut out and in the one piece of card told the whole nativity story.